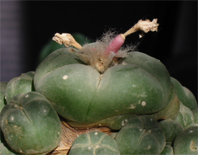 Flowering Lophophora jourdaniana, take two. 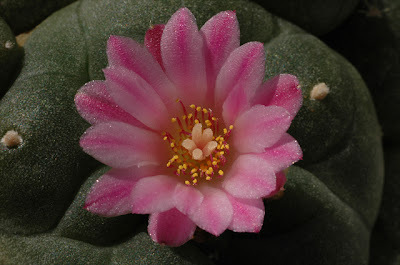 One of my Lophophora williamsii v. jourdaniana plants is flowering again – this time with the full cooperation of the sun, resulting in a much more well-developed flower compared to the previous one. 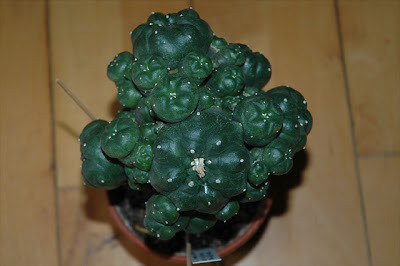 Like many other species of cacti (including the other Lophophora species/varieties) L. jourdaniana has thigmotropic stamens, i.e. 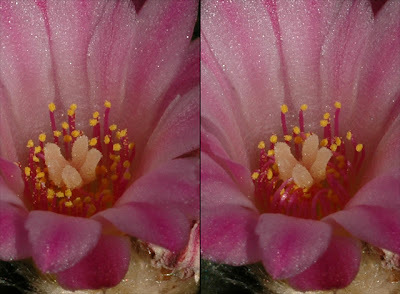 stamens that when touched fold in around the style (as is evident for the front stamens in the rightmost picture). 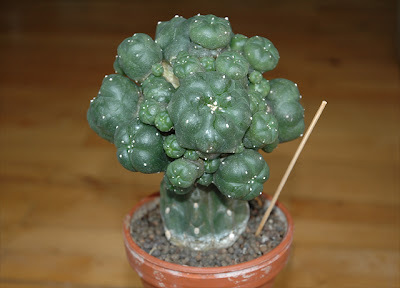 The following stop motion video provides a better illustration of the thigmotropic mechanism - I'll try to make a higher quality movie the next time the plant flowers.